The Biosensors for bioengineering group is a junior group under IBEC’s Tenure Track scheme. Formation of 3D ESC aggregates in GelMA hydrogel using dielectrophoresis (DEP). 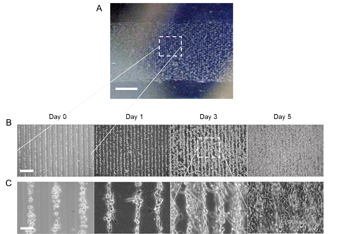 The stem cells in the GelMA prepolymer were introduced into the 100 µm height chamber and localized by DEP forces to the low electric field regions within the microelectrodes. The GelMA prepolymer was then exposed to UV light, embedding the cells in a stable microscale organization. Scale bar shows 100 µm. Drug discovery pathway relies heavily on in vivo animal models and in vitro cell mediums. In the case of animal models we have not only some ethical problems but also the ability to extrapolate data to human conditions is limited and in vitro platforms often do not simulate the complex cell–cell and cell–matrix interactions crucial for regulating cell behaviour. The Biosensors for Bioengineering group is focused in a new line of research that has become of extreme importance in the last years. The idea is to integrate biosensor technology and nanotechnology with stem cell research and with tissue engineering. Engineered tissues are integrated with biosensing technology to obtain microdevices for detecting cellular responses to external stimuli, monitoring the quality of the microenvironment (e.g., metabolites, nutrients), and supporting diverse cellular requirements. This research on 3D-functional engineered tissues is expected to develop knowledge of tissue construction and their functions and relation with some human diseases. Integration of fully functional tissues with microscale biosensor technology allowed us to obtain “organs-on-a-chip”. These chips could be used in pharmaceutical assays and could be a step toward the ultimate goal of producing in vitro drug testing systems crucial to the medicine and pharmaceutical industry. 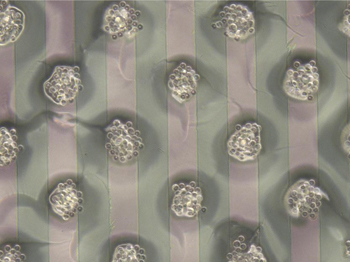 Right: Picture of aligned C2C12 muscle cells within hydrogel as obtained by the dielectrophoresis (DEP) technique using 50 µm electrode 50 µm gap device (A). Phase contrast images of the aligned C2C12 muscle cells within hydrogel at different culture times (B and C). Scale bar shows 0.25 cm, 400 μm, and 50 μm in A, B, and C, respectively. 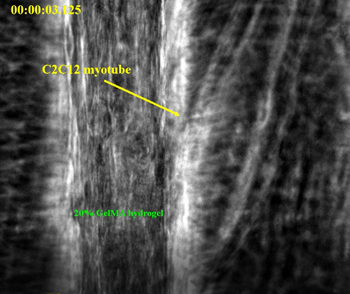 Myotubes differentiated in a groove-ridge topography GelMA-CNTs composite loaded with 0.3 mg/mL CNTs. Immunostaining of cell nuclei/myosin heavy chain showing the highly aligned C2C12 myotubes. 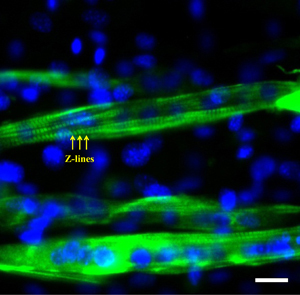 Z-lines were also observed for the myotubes indicating high maturation of muscle myofibers. Scale bar show 20 µm. This weekend Javier Ramon’s European Research Council-funded project, DAMOC, was one of eight highlighted in a special exhibition in Madrid to mark the ERC’s tenth anniversary. 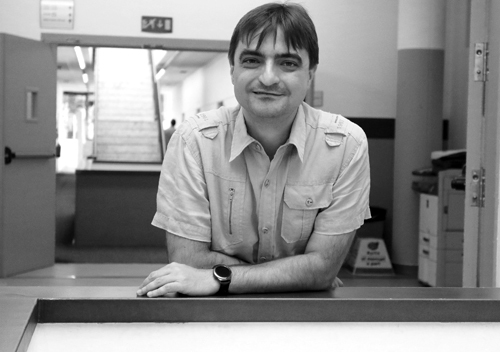 IBEC’s Dr. Javier Ramón is one of just six researchers in Catalonia to have been awarded a 2016 Starting Grant by the European Research Council (ERC). Abstract New biocompatible materials have enabled the direct 3D printing of complex functional living tissues, such as skeletal and cardiac muscle. Gelatinmethacryloyl (GelMA) is a photopolymerizable hydrogel composed of natural gelatin functionalized with methacrylic anhydride. However, it is difficult to obtain a single hydrogel that meets all the desirable properties for tissue engineering. In particular, GelMA hydrogels lack versatility in their mechanical properties and lasting 3D structures. In this work, a library of composite biomaterials to obtain versatile, lasting, and mechanically tunable scaffolds are presented. Two polysaccharides, alginate and carboxymethyl cellulose chemically functionalized with methacrylic anhydride, and a synthetic material, such as poly(ethylene glycol) diacrylate are combined with GelMA to obtain photopolymerizable hydrogel blends. Physical properties of the obtained composite hydrogels are screened and optimized for the growth and development of skeletal muscle fibers from C2C12 murine cells, and compared with pristine GelMA. All these composites show high resistance to degradation maintaining the 3D structure with high fidelity over several weeks. Altogether, in this study a library of biocompatible novel and totally versatile composite biomaterials are developed and characterized, with tunable mechanical properties that give structure and support myotube formation and alignment.